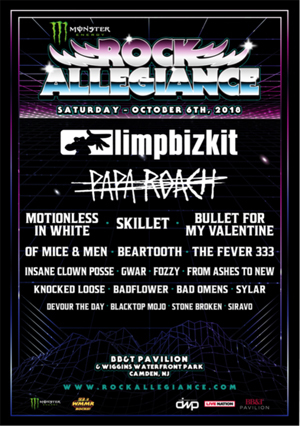 The band performance times have been announced for Monster Energy Rock Allegiance, returning for the fourth year to the Philadelphia area this Saturday, October 6. The Northeast’s biggest rock experience will feature 20 bands at the BB&T Pavilion & Wiggins Waterfront Park in Camden, NJ, including LIMP BIZKIT, PAPA ROACH, MOTIONLESS IN WHITE, SKILLET, BULLET FOR MY VALENTINE, OF MICE & MEN, BEARTOOTH, THE FEVER 333 and many more. The food lineup for the festival includes: Baby Blues BBQ, Chickies & Pete's, Lil Trent’s Treats, Nico's Pizza and More!, Sum Pig Food Truck, Tony Luke’s Cheesecake, and more.